Baby Bloomers is a 5 reel and 10 paylines video slot, powered by Booming Games software platform. Baby Bloomers video slot is inspired by Spring, when everything comes back to life and blooms after long winter. 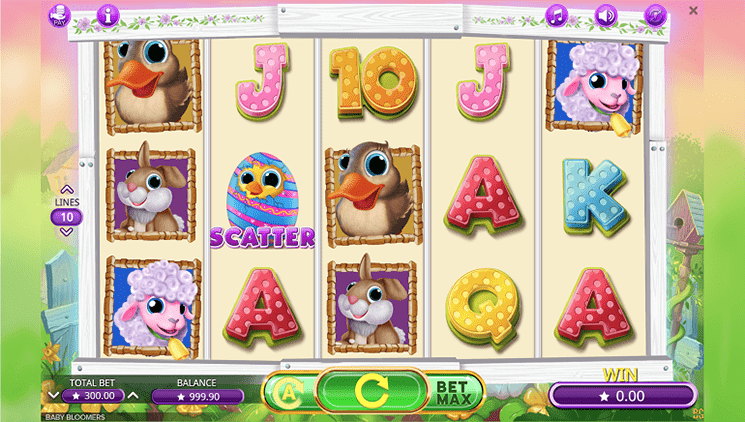 Video slot have very cartoony and childlike design, where everything is cute and happy. Low value symbols mostly are your standart playing cards (10’s – A’s). Premium value symbols are baby animals such as ducks, sheep, chickens and easter bunnies. Even though video slot have only 10 fixed paylines, players can find great features such as Free Spins, Wild Multipliers and Expanding Symbols. Before investing real money players can try Baby Bloomers Slot for free, or visit any Booming Games casino such as: Vegas Crest Casino, Mr.Bet Casino, Columbus Casino and others to play with real money and win. Before you visit baby animal farm, you need place your wager. By using “Coin Value” button player can set coin denominations which range from 0.01 to 1. With “Line” button ou can set the number of lines you want to bet. To start the game with already highest bet amount use “Max Bet” button. “Autoplay” will spin reels automatically without any interruptions and click “Spin” to start the game. Wild symbol in the game is represented as a Butterfly. Wilds can be used as a substitute to any other paying symbols, to make a winning combo. In addition Wilds also can make their own winning combination. Butterfly symbols is a most high paying symbol and if you are lucky 5 or more Wilds will award you with x1000 multiplier. One of most popular features in slot games, is a Free Spins feature. If you manage to land 3 or more Scatter symbols, you will be awarded with 10 Free Spins. In addition another 10 Free Spins can be re-activated during this feature. Expanding Symbols feature is also triggered with Scatter symbols. Before Free Spins feature starts you need to press “Stop”, then game will choose randomly which paying symbol will be expanding. If 3 or more symbols are expanding, they will cover whole reel.